Hos Dorte: It's a LOVE themed Blog Hop!! The stamp & sentiment are perfect! Hey Dorte, Welcome to your first challenge as a DT member!!! Love this little heart breaker stamp, must get mine out and ink it up. Pretty red, black and white color combo and those papers are wonderful. So glad you have joined us. This is gorgeous, an adorable image. Loving your design. Thanks for joining Die Cut Dreams and Oldie But A Goodie too, good luck. Hee hee This is so cute. Your textures and the layout are super fun. Great card! oh gorgeous sweet card!! congrats to you for making it on the fab HM team! What an adorable card! Love all of your embossed hearts and the stamp is precious with the nibbled bit of heart biscuit. Delightful card! What a fabulous creation Dort. You have shaded the image and cup cake so beautifully it looks as though you could pick it right out of the picture. Thanks so much for joining our Hearts theme at Allsorts this week, good luck and hope to see you again. Your card would also fit the theme at our sister challenge Penny Black and More - closes tomorrow night. gorgeous card. just hopping by, but will drop by again really soon. what a gorgeous card love the pretty colours and the embossing hearts!!!!! Precious card. I love everything about it. The papers, embellishment and, of course, the image. Thank you for sharing. Ho Dorte awww what a cute image this is lovely papers & layout fab colouring great take on my chall theme. This is a really sweet card- love how the colors pop and that mouse image is too cute! Congrats on your new design team! :) Thanks so much for joining us at Pile it on this week! This little guy just looks so darn happy with all of that chocolate!!! ha ha Wonderful job coloring, congrats on the DT spot! Fantastic! What an adorable card Dorte! Thank you for entering our final challenge at Die Cut Dreams, great to have you as a participant! Hope to see you around blogland in the future! Cute little micie image - I love this one! Thank you for showing your card, the papers matching great. The DT-Ladie blog hop is such a amazing thing - I love it. Oh so very pretty. Love the hearts embossed in red and a precious image! A darling card. Love the cute little mousey image. Nice heart dry embossing. Thanks for joinging us at sentimental sundays challenge. Love this card and it is just so cute that I actually giggled out loud!! Love it! Aaaah, this creation is just adorable ... one cant but just love the mice-ies. I love the cute image - beautiful detains and colouring!! 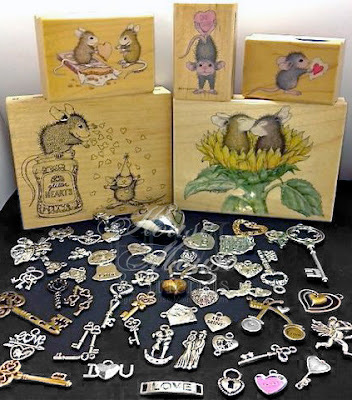 This is my first comment on your blog and I would love to welcome you in our House Mouse family. Your card is truly amazing and I am looking forward to your next works and cards. He is a little heart breaker! Very pretty card - I love the colors! Wishing you a happy day! Hi Dot, Your card is just delicious, love the layout, colour and that sweet HM image. Fab creation hon. Off to Hop now. A fabulous card and congratulations on being part of the HM DT. Darling darling card....I have not seen this stamp...so loving it! I hadn't seen this image before - mouse is too cute munching away on the cupcake. Lots of nice details on your card. Yummy and cute card. Love your embellishments and the color combo. Such a wonderfully designed card. Such a beautifully detailed and cute card! I love the image, and especially that little "bow" with the pearls on a wire! The charm is such a cute embellishment too! Hello Dot! This is just ridiculously adorable! I love the layout and how you used all and the colors are just FAB! Super card, I adore the image you have used. Great hop ! A beautiful card these mice are just so cute, off on the hop. Beautiful yummi and sooooooooo gorgeous! This is adorable Dorte! Congrats on your new DT position! This is so cute! I love that cute image and all of the little details that you have added! Beautiful papers - love the black, red, and white together! And such a cutie mouse!!! Hi. Lovely card - could do with some cake myself. LOL. Congratulations on your new dt post. ou have a lot to offer the team. Love those mice. Wow...what a beautiful creation! Love your card! Congrats on being of the new DT members!! Dorte, your card is gorgeous, I love the layout and beautiful DP too!! Adorable card. Looks good enough to eat. What a happy little HM. Love your combo of the papers and this all looks nice with your mouse. Thank you for playing along with Paper Sundaes. Stop by for our new challenge this weekend. Well done on your first Dt post. Beautiful card with an adorable image. Stunning card! Thanks so much for joining us this week at Sentimental Sundays! 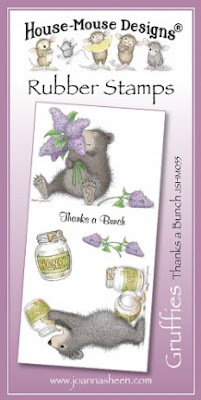 Very pretty little card Dot and I love your sentiment, we all need a little sweetness in our lives! I'm hoping to get my card made this weekend, in the meantime, I'm hopping around the blogs! Congrats on joining the DT too! An adorable card Dorte and congratulations on your new DT position, it is well deserved. Sweet and cute card, Dorte. I like how you designed the backside, too. Great card. Thanks for joining us at Sentimental Sundays. Please join us again soon. I can totally get into the love for cookies! This is beautiful! Thanks for stopping by and playing along with us at Sentimental Sundays. So cute! Love the image! You did a great job on your card. Congrats on joining the House Mouse and Friends DT. Your first DT card is fantastic. Love it. What a lovely card. So sweet. Nice stamp. So funny. A lovely card, such a cute image. Such a sweet card - that image is adorable and I love the embossed hearts and your own presonal stamp onthe back. Congrats on your DT spot and thanks for a great blog hop and the chance to win such fab prizes. Dette var et utrolig flott kort. Herlig motiv og jeg digger sammensetningen av forskjellig papir. Tusen takk for at du deltar hos SFTW og lykke til. Oooh! I haven't seen this stamp before. ADORABLE! Very cute image and your layout is awesome. I totally love how you do the backs of your cards - impressive. I think we all should pay more attention to the back of our cards! so stinkin cute! Love the chocolate. I love this sweet image! A beautiful creation. Very cute card. Some inspiration for how I can use that stamp. I just love the mouses!!! And your`s is soooooooo sweet! Så vackert kort du gjort! Och jag gillar din egen stämpel på baksidan! Love your card! Indeed we do all deserve something sweet. I like the embossed heart panel down the side of your card. I need to remember that more often--that one does not need to have the entire background embossed. Great first DT card! I hope we can play again together soon. How sweet! In EVERY sense of the word! :) Looking forward to seeing your DT work every challenge! Love the polka dots you used to set this card off. It is just the right touch to make the rest of the Valentine pop. Nice one! Such a gorgeous card. Glad that you added polka dots to the background. I love polka dots! Great job!